Pierce’s disease (PD) is a vascular disease of grapes vectored by xylem-feeding sharpshooters and leading to vine decline, yield loss, and vine death. Recent warm winters have increased concerns about PD in Virginia. The authors conducted a survey of 31 Virginia vineyards in 21 counties for X. fastidiosa in late fall, 2006. The survey confirms X. fastidiosa in the northernmost vineyards sampled, and in some of the westernmost vineyards in Virginia. 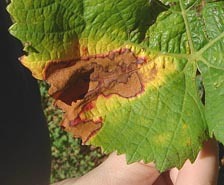 It is likely that all vineyards throughout the sampled area are at risk of PD.